Because of the yoga variations swirling around today, I hope the following list will enlighten the student to a deeper understanding of this interesting and sometimes confusing topic. The Yoga systems - Direct experience is the goal of yoga; awareness of what is real, free of the constraints and fluctuations of consciousness. Mastering of the forces of the universe, surrendering gross vibrations of the external world to refine the vibrations of the internal and then to become one with the subtle vibrations. This is a sample of the "kinds of yoga," but not a complete list. Like the sects of Protestantism and other Christian sects, for example, they are almost too numerous to list, and like other human-made systems will continue to expand in number. The types of yoga below, are the most notable, historical, or the ones we hear most about today. Abhava yoga - Yoga of nonbeing. Adhyatma yoga - First spoken of yoga as spiritual method in the Katha-Upanishad (6th century BCE or earlier) - yoga of inmost self, whereby the sage may come to know the great force hidden in the cave of the heart. Asht-anga yoga - Yoga of the eight limbs of Patanjali's system of the Yoga Sutras. It consists of the eight practices of the eight limbs from Book II, sutra 29. Today, this yoga is used to describe the vigorous, vinyasa style of Jois, an Indian yogi. I believe Madonna made this one popular in the West by being a practitioner. Bhakti or bhakta yoga - Approach of the heart. Ideal of devotion (bhakti) to the divine as a superperson (purusha-uttama). The Gita (Bhagavad Gita) introduced this concept - 4th, 5th century. Devotion to an ideal. Union by love. Aspirant devotes oneself to a special deity or guru. Narada Sutra says love (Bhakti) is easier than other methods. It's being is the nature of peace and supreme bliss. Divided into 2 divisions. !.) preparatory, and 2.) Devotional. One prepares oneself for the holy guardian angel. Christ was a Bhakti Yogi. Bikram yoga - Yoga named by Mr. C. Bikram. Yoga room is over 100 degrees. Only 26 yoga postures are practiced over and over in this "style." Mr. Bikram lives and serves in Hollywood. Currently very popular fad yoga. Classic yoga - Yoga of India and that of Patanjali's yoga sutras. Gnana yoga - Union through Knowledge. Gnana yoga is that yoga which commences with a study of the impermanent wisdom of this world and ends with the knowledge of the permanently wisdom of the Atman (self); 1. distinguishing the real from the unreal - viveka; 2. indifference to the joys and sufferings of the world - vairagya. 3. Release, and the unity with Atman -mukti. Wisdom is a key word. Everything culminates in wisdom, fire of wisdom, nothing so pure as wisdom. Hatha Yoga - Forceful yoga; linked to the name Goraksha - 10th century master. Control of the physical body in order to open it to the cosmic energy by breathing and physical exercises. Helps to manipulate the life force (prana), breath control, mental concentration. The eight limbs of yoga apply to hatha and raja yogas. Hatha yoga has come under attack and rejected because "it merely leads to pain." It is also said that one can lead an animal into the stall by enticing it with fresh grass or by whipping it, which causes the animal to panic. The first way is better, thus gentle yoga practice is the best and most effective way to practice this physical discipline. Hatha yoga is seen as the stairway to raja. Ha and tha stand for sun and moon or balance; sun is the front and moon is the back. Hatha yoga's objective is to transform the human body to make it a worthy vehicle for self-realization. The yogin becomes free from limitations such as disease, removes dullness, defects and impurities. The body becomes youthful. When the body is healthy and free, one can sit still and explore the mysteries of the unknown without conflict or distortion. See eight limbs. Integral yoga - (purna yoga) Sri Aurobindo described his spiritual approach as integral yoga. Combines quest for individual liberation with the evolutionary destiny of humanity. This yoga style purported to offer a viable spiritual integral path for the present global crisis. He understood this as a transition from the mental to the supramental (or divinely inspired) consciousness. Iyengar yoga - yoga named by Mr. Iyengar. Author of "Light on Yoga." Often described as very intense, also referred to as rigid form. Predominately hatha yoga style. Mr. Iyengar lives in India. Jnana yoga - Withdrawal of consciousness from the outer world of the senses by working from the center to the periphery to effect union of higher to lower by control of thought. Karma yoga - conscious execution of actions. Control of one's actions from non-selfish motives. Union/yoga of good deeds. Union through work, related to gnana yoga. Key to karma yoga is control, or restraint. Image: being calm in stressful surroundings. Kriya yoga - Yoga of ritual action. Its goal is to awaken the kundalini through mental focusing (dharana) and breath control on the basis of bhakti yoga. 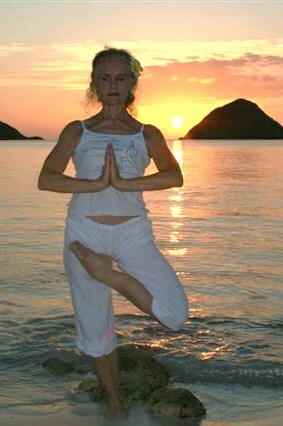 Kundalini yoga, agni yoga, or laya yoga - Seeks to control the vast psycho spiritual energy of the body. Concentrating on the psychic centers to awaken the primordial cosmic energy of the individual. Also: fire yoga. Mantra yoga - Meditative recitation of sacred sounds. Making use of the repetition of certain words and phrases to steady the mind. Union through speech. Repetition until the word spoken become one in a perfect concentration. All prayers can be turned into mantras. Repetitions of names of gods for example when the speaker, the Great opens the Eye. The first chakkra --- four petalled Muladhara - lotus is the seed of speech, brilliant as lightening.. Mantras are given by guru. After so many reps, once can rise above the ground; and more, be absorbed by the absolute. Power yoga - intense vinyasa style, hatha yoga. Very athletic, rapid. Prepares body-mind for ashtanga. Raja yoga - Classic yoga recognized by Brahmins as on of the six orthodox systems and is said to embrace all six yogas: karma, bhakti, jnana, mantra, laya or kundalini and hatha. Referred to also as the yoga of good will. Defined as the earliest and most scientific treatment of the subject of self-transformation, for the attainment of union with the Real, the Eternal. it develops will through concentration and meditation by tuning the nervous system to be in harmony with higher vibrations. Raja yoga has eight steps: yama, self restraint; niyama, self-discipline; asana, posture; pranayama (control of the breath; pratyahara, control of the senses; dharana, concentration; dhyana, meditation; samadhi, contemplation. The three fold process, samyama, includes dharana, dhyana and samadhi: awareness, meditation and ecstasy are included in raja yoga. In the yoga sutras, hatha yoga, asana and breathing is seen as preparation discipline for the samyamas. The split in the ashtanga happened in the 11th century when an attempt was made to distinguish the meditative and the physical aspects. There is no distinction.